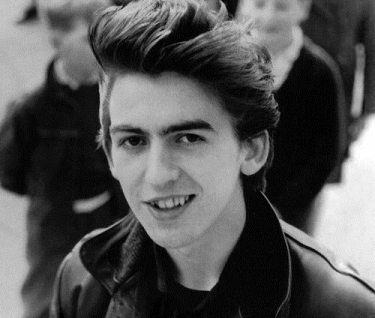 My favorite Beatle passed away exactly ten years ago. November 29, 2001. It’s a bummer I was only 6. *sigh* I was born in the wrong decade. True story. In honor of this depressing anniversary, I made food. Surprise? I always forget how to hard boil eggs, and then I get really perturbed (nice use of a big word, no?) when people on WikiHow tell me how to. It usually involves getting eggs from some magical chicken and then boiling them in water for 7 minutes and 12.5 seconds and then doing some weird dance while peeling the shells. Well, maybe not…but it’s just generally annoying. So, for your sanity, here’s now to hard boil eggs. Take some eggs, put them in a pot and fill the pot with cold water. Add salt to the water. Put a lid on the pot, stick it on the stove, and turn the stove to medium-high heat. When the water starts boiling, turn off the stove. Keeping the pot lid on, let the eggs sit in the water for 10-15 minutes. Rinse under cold water and peel. You’re welcome. 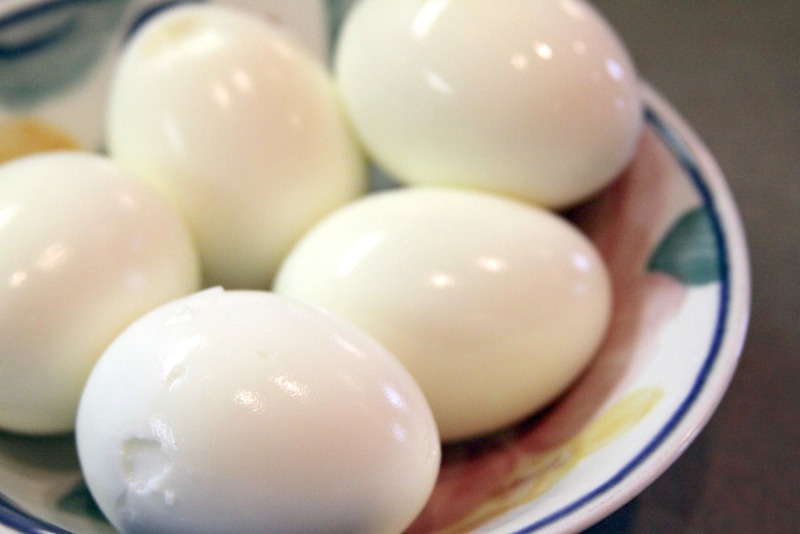 Have you ever tried to take a picture of peeled hard boiled eggs? No? Good. Because it’s difficult. Especially when the egg in front wants to turn out whiter than Justin Bieber. This picture bothers me, in case you couldn’t tell. If you hard boil your eggs and the yolks look a little grey-ish, don’t panic. You won’t die if you eat them. Probably. The yolks get grey if you overcook the eggs. 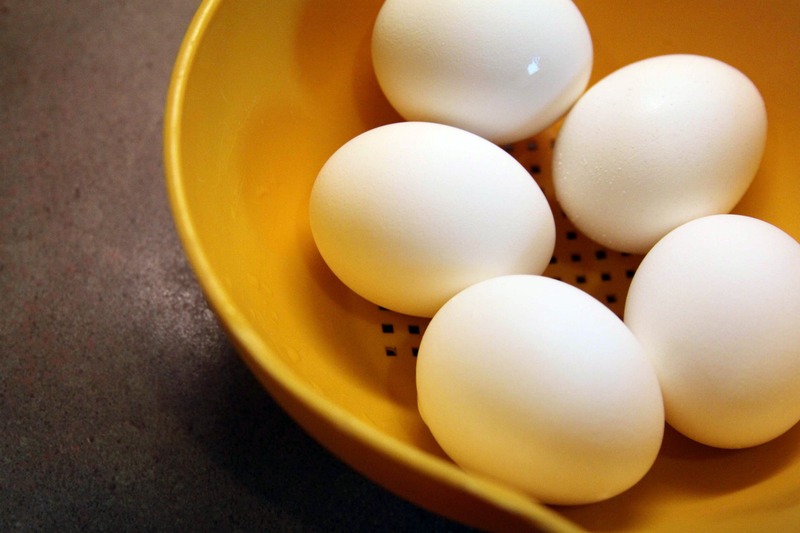 The egg yolk gets grey colored when the iron in the yolk reacts with the sulfur in the white part. Yes, I looked it up. Yes, I might be a bit of a dork. And yes, the yolks are totally edible to eat. I was being sarcastic. 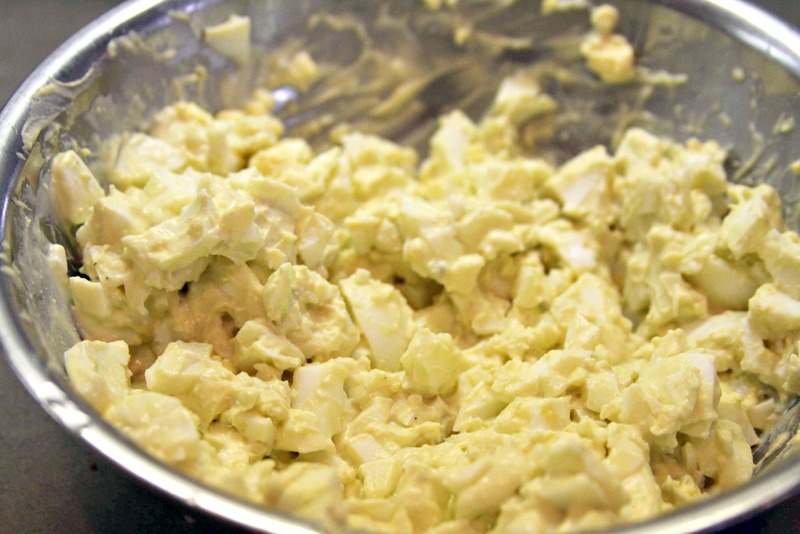 The best part about egg salad is that it’s so easy, even lazy people like myself can make it. 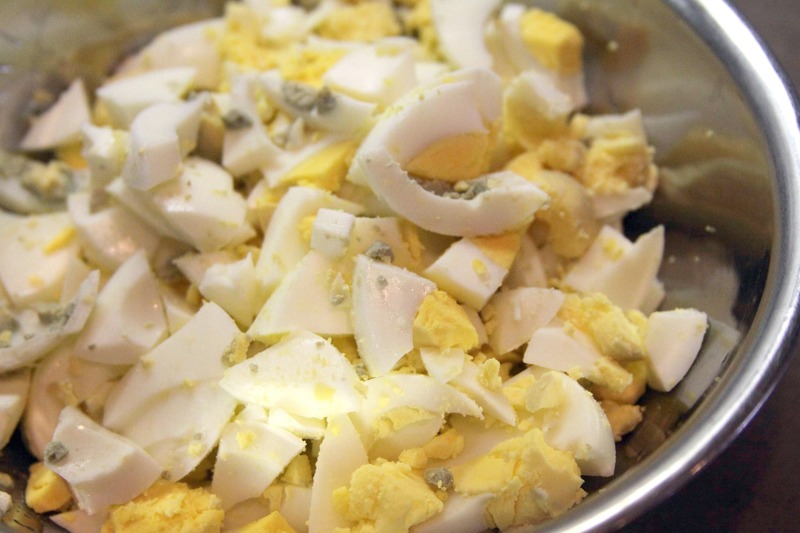 To feed my gigantor family, I used 8 eggs, 1/2 cup of mayo, 1 tablespoon of dijon, some salt & pepper, boom. Instant deliciousness. And we ate every last egg crumb…thing. 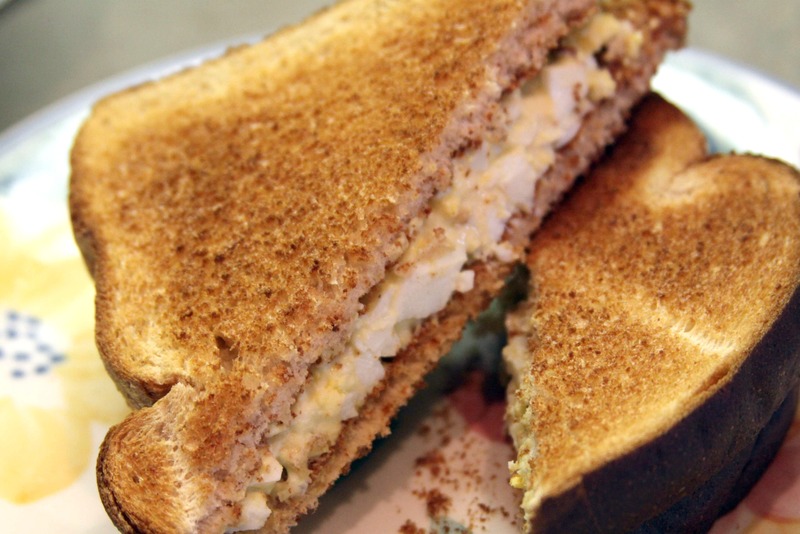 So go take some cheesy pictures of your egg salad sandwiches, wear some purple (George’s favorite color), and listen to Abbey Road, because it is only the best Beatles album. Ever. Duh. 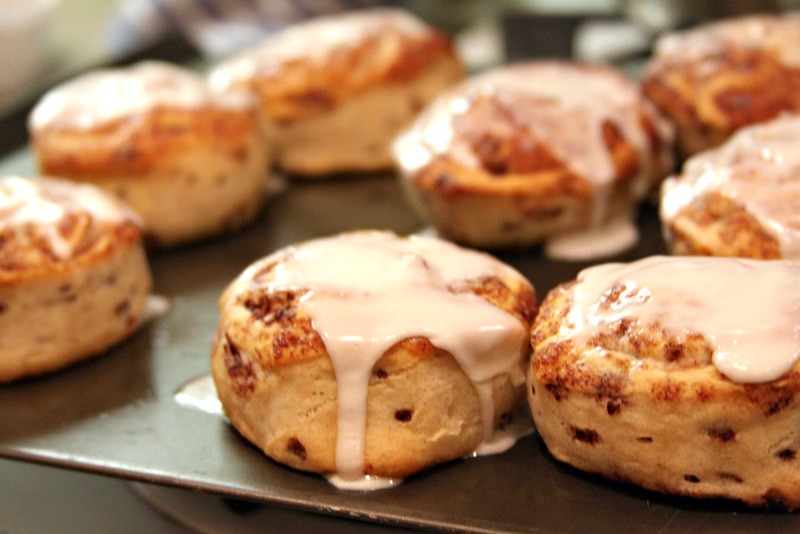 And I also made cinnamon rolls. Because those things are delicious. You know what’s awful? Bad moods. Seriously, they’re horrible. They’re the opposite of thebombdotcom. And the worst part is that there’s really no reason behind my bad mood, which makes me even grumpier. And what’s worse than the worst part is that I’m really not in a writey mood tonight, but I have lots to say. I’ve rewritten this post like 5 times and I’m still not happy with how it’s turning out. So now I’m going to pretend that I’m totally happy, and I’m just going to start incoherently rambling, ok? Ok. Lovely. I got my hair cut. And it’s the most amazing haircut I’ve ever gotten in my life. IN. MY. LIFE. It’s really, really short (at my jaw…ok that’s short for me.) and it’s longer on one side and I have bangs and *sigh* it’s just generally awesome. I made a pie. I’m seriously worrying about how the gluten-free crust is going to turn out since I didn’t add the 2 tablespoons of sweet rice flour (shhhh don’t tell anyone) that the recipe told me to add. Actually, it said “make sure to use the sweet rice flour in the crust or else the world will explode and no one will figure out if the hokey pokey is what it’s all about and we won’t find out what happens between Shawn and Juliet on Psych and no one will be in Whoville to cut the roast beast because they’re all dead from the world exploding and it’ll be all your fault.” Ok, I kind of exaggerated some of that, but it really did insist on the sweet rice flour. What is sweet rice flour anyway…? Unfortunately, we’re not going to know how it tastes until we eat it Thursday at my grandma’s. Oh, by the way, I’m going out of town from tomorrow until Saturday. I shall have stories and pictures when I return. Or not. We’ll see. I went to a restaurant. Yes yes, I left the house. Who’s proud of Picco the Antisocial leaving the house? You are? Please allow me to dub you my new best friend. Anyway, I went to P.W. Pizza conveniently located in St. Louis, Missouri. Ok, it’s only conveniently located if you live in St. Louis. P.W. 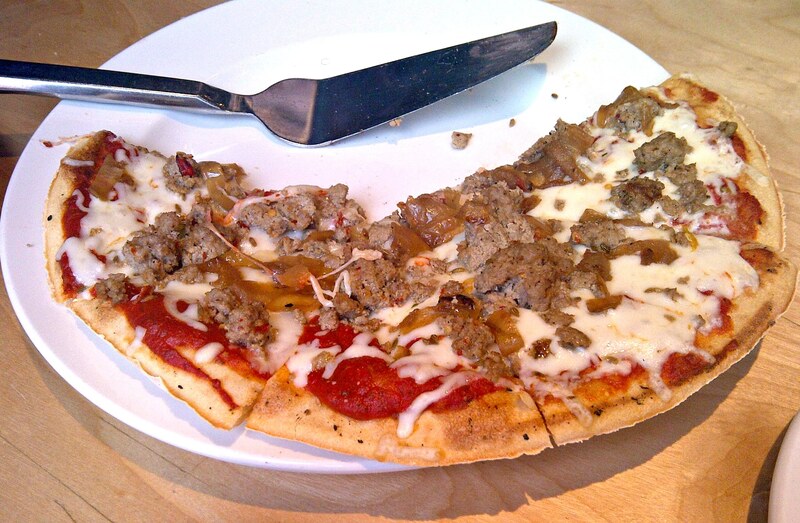 Pizza is a wonderful place that serves gluten-free pizza. Perfect for those who have Celiac or who have an irrational fear of wheat. For those of you who do have an irrational fear of wheat, please keep that fact to yourself. It’s weird. Would you care to see what I ate at the lovely restaurant? That’s kind of a rhetorical question, because I’m going to show you anyway. First we have my BLT salad. You heard me right. 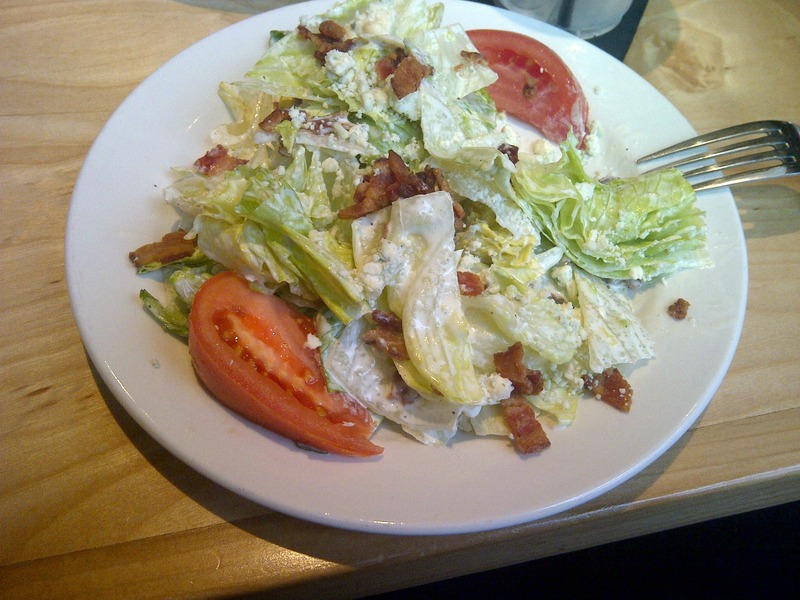 Bacon, lettuce and tomatoes in a salad topped with bleu cheese crumbles and ranch dressing. Umm hello, yum? I’m going to be recreating this sometime soon. Mainly because it contains bacon. I love bacon. Now you’re craving bacon and/or pizza, right? I know I am. But I need to skedaddle, because I’m not done packing. And…umm, am I the only one really depressed about the thought of depriving dead Whos of their roast beast? 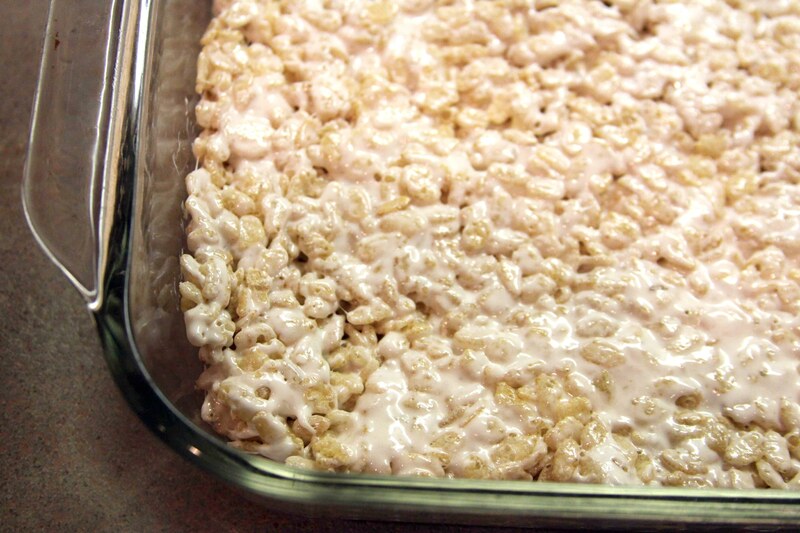 Rice Krispie treats should be illegal. Letting 16 year old people use the microwave should be outlawed too. But that’s for a totally different reason that I’m not going to go into. Ok you forced it out of me. I stuck something in the microwave that I was 100% sure didn’t have metal on it, aaanndndd apparently it did have some metal on it, and it started to spark and almost blew the whole house up. Not really. It only lit up a bit and I screamed like a maniac and turned off the microwave. The end. Wasn’t that a riveting story? I’ll tell it again later. Rice Krispie treats have to be an American thing. I mean, first off, crispy is spelled with a “k” and an “ie”. 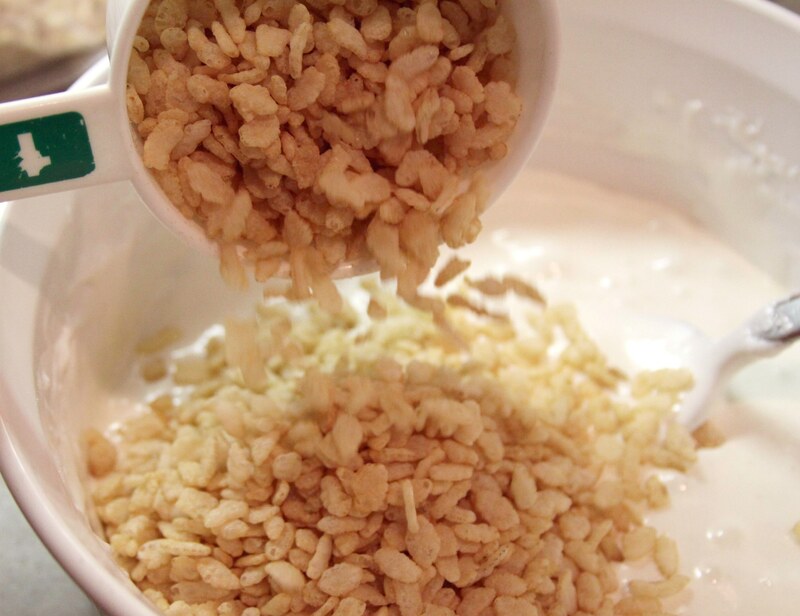 And also the only ingredients are butter, marshmallows, and puffed rice. That doesn’t sound like anything non-Americans would want to eat, am I right? 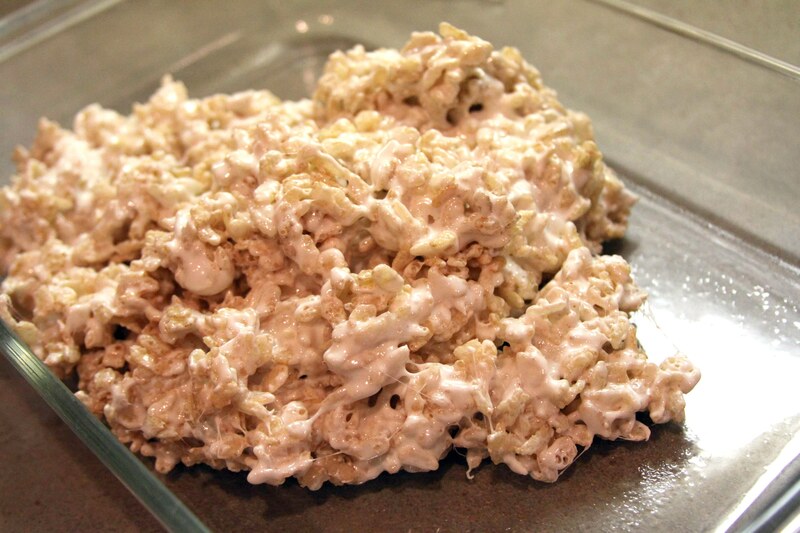 To make these delicious treats gluten free, you’ll have to buy Gluten Free Rice Krispies. 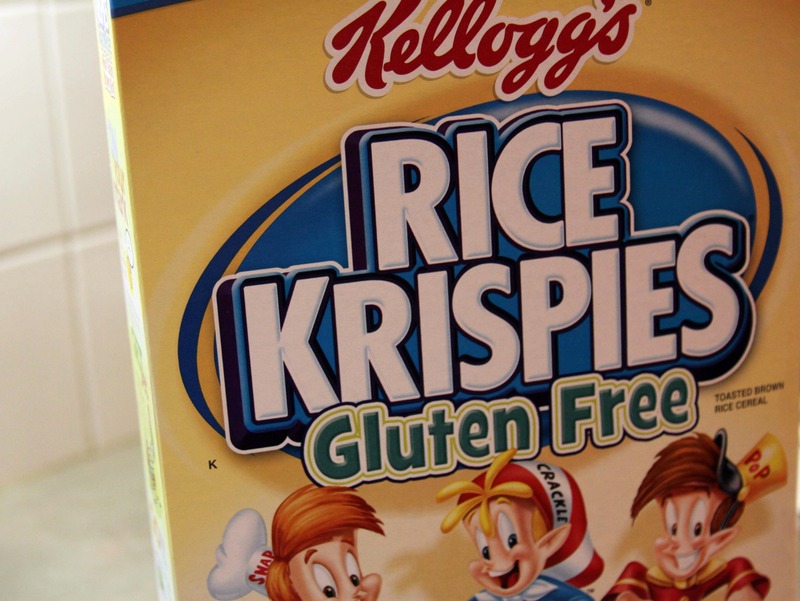 You’d think that regular Rice Krispies would be gluten free, but nooooooo. They contain malted barley. Speaking of, have you ever heard a British guy try to say “malted barley” with an American accent? I have. I’m not even going to go into why he was saying malted barley, but it was amazing. Reason number 5 bazillion why I love the English. Seriously. Wow, that was a great story too. I’m just in prime storytelling-mode tonight. 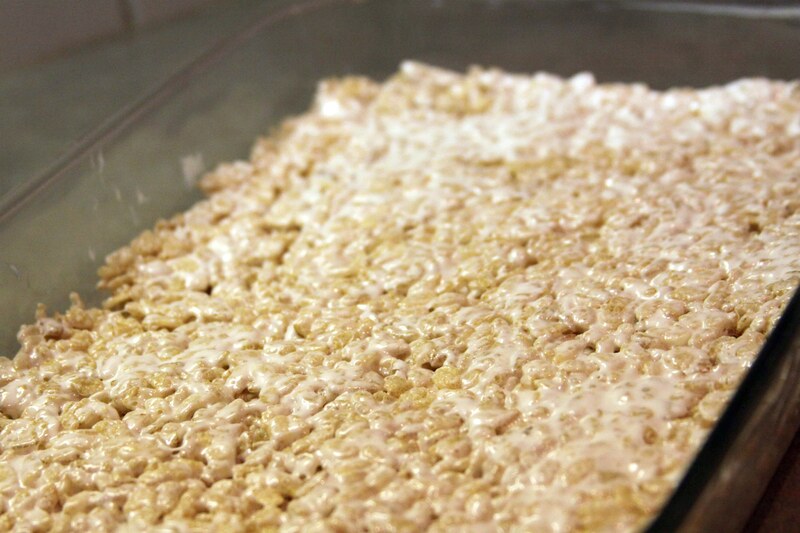 So back to making these Rice Krispie treats. First step? 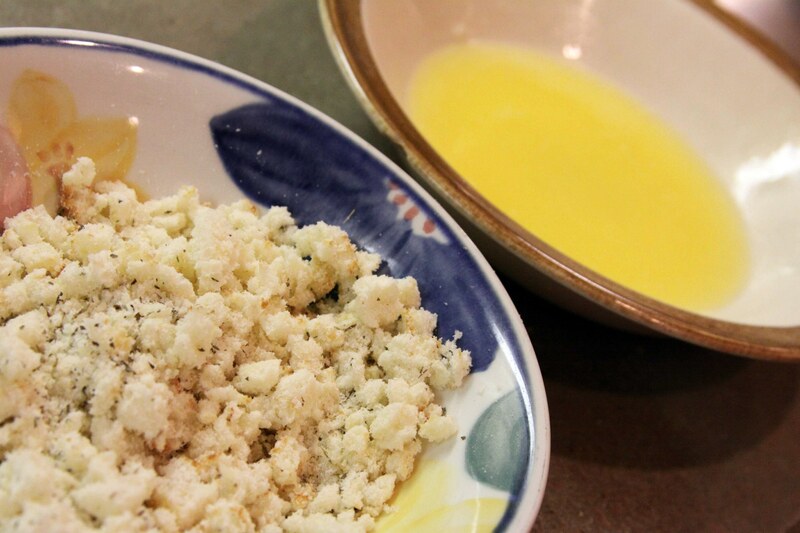 Take 3 tablespoons of butter and stick it in a bowl. Oh butter, where art thou? Oops, you’re covered by nearly a pound of marshmallows. 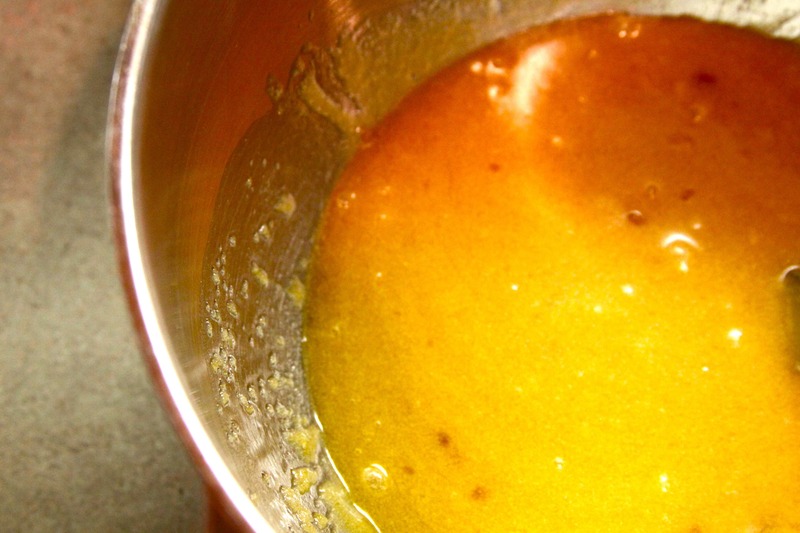 Stick it in the microwave (MAKE SURE YOUR BOWL ISN’T MADE OF METAL), and melt until…melty? Then add rice krispies. Also, take really cool pictures of yourself pouring rice krispies into the marshmallow/butter mixture. It’s really fun. Then, spread out the mixture with a buttered spatula. You heard me right. Buttered spatula. So basically, I used a cooking utensil coated with butter to push down a food consisting of butter, calorie-filled puffed air, and rice lacking malted barley? Yum. And then go find someone from England and tell them you’ll give them a rice krispie treat if they attempt to say “malted barley” with an American accent. It’s hilarious, believe me. Use buttered spatula to evenly press mixture into 9×13 inch pan coated with cooking spray. Cool. Cut into 2-inch squares. Orrrrr, you can do it the cheater way like I did and make them in the microwave. In microwave-safe bowl (non-metal. 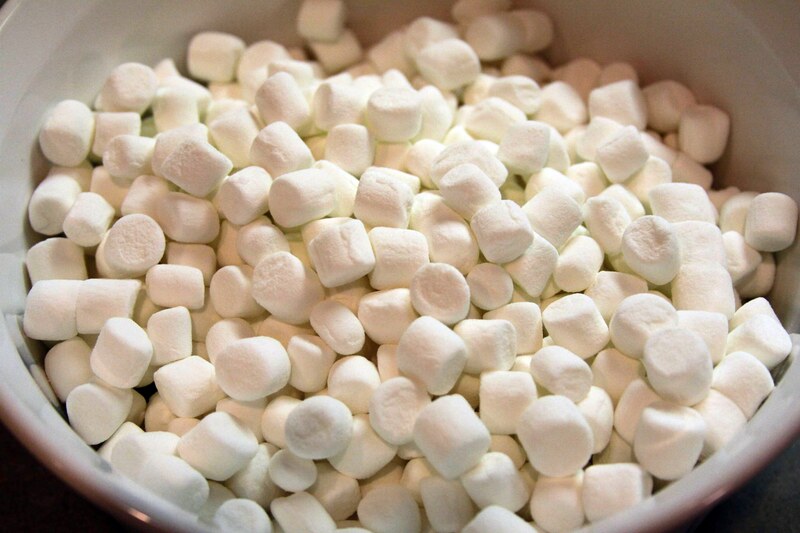 Just reminding you…), heat butter and marshmallows on high for 3 minutes, stirring after 2 minutes. Stir until smooth. 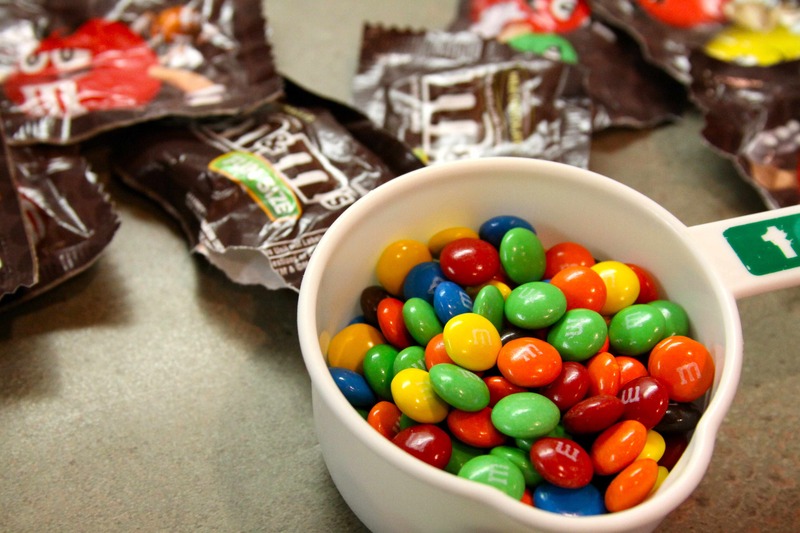 Store tightly covered, or just eat them all in one day. I recommend the latter. I made cookies. In case you couldn’t tell. But not just any cookies, no sir. On a scale of 1 to Christian Bale, these cookies are up there near Mr. Bale. In Piccoland, that means that they’re pretty dang fantastic. Oh and for the record, I have no clue why the sugar and butter mixture is orange. One of the best parts about these cookies is that once you roll the dough into a ball, SHAZAM, you pull it apart. So then you have two globs of dough. But wait…then you stack them on top of each other! Can you tell I really had fun making these? It was kind of the highlight of my day…err…life. But seriously, these cookies are so good they make you want to smack your mama. Ok, not really. I’m sure your mother’s a lovely woman and not in need of a smack. But you know what I mean. Yeah, I got hungry and started to eat one of the cookies. And then realized it would make for a cool picture. Aaannnddd then I realized that no, it really wouldn’t make for a cool picture. More of a lame picture that shows I have no self-control when it comes to food. The end. 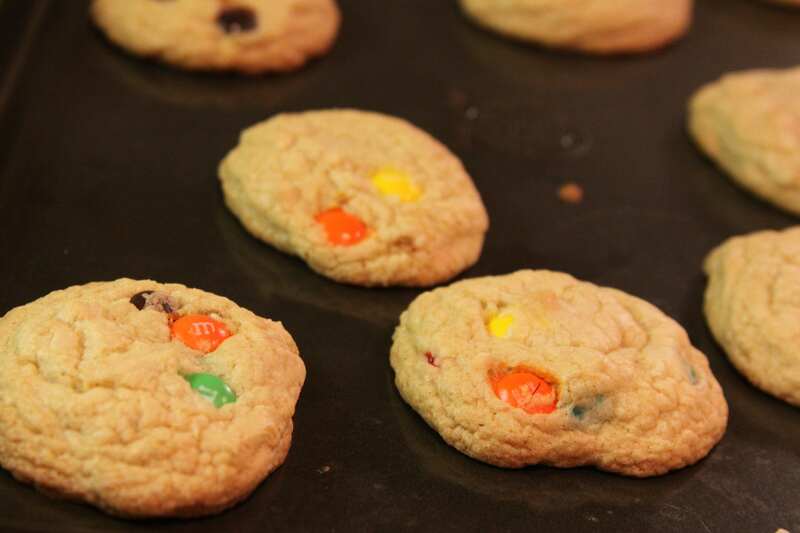 Thanks to How Sweet It Is for the cookie recipe that is too fantabulous for words. 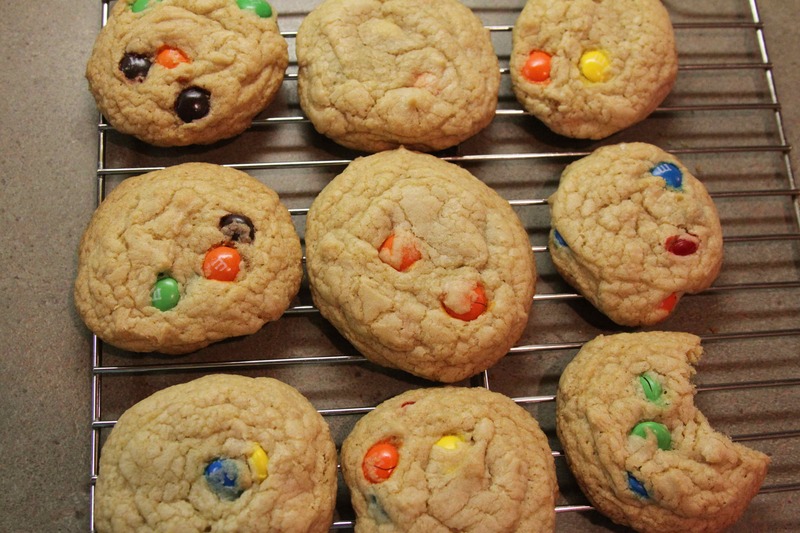 I’m too lazy to type up the recipe, but if you click here, it will take you to her post about the cookies. And one last thing before I post this and go read my new favorite book, Pride and Prejudice (funny story, actually. But more on that later. 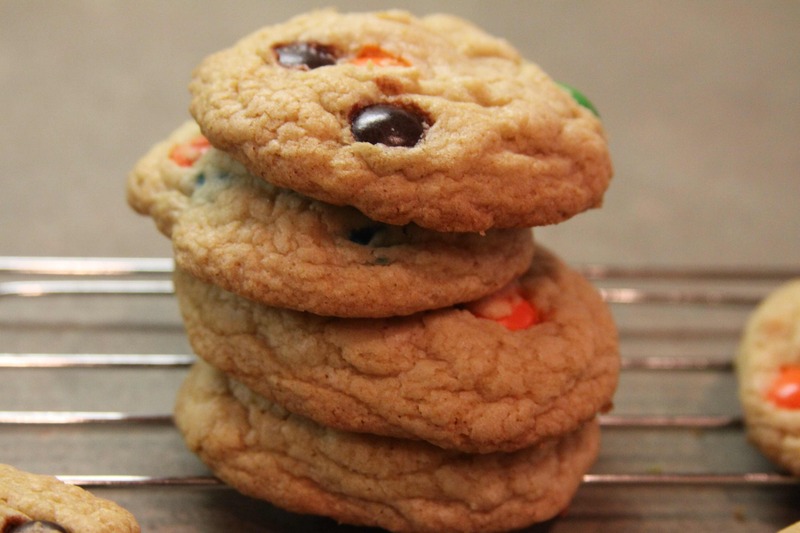 ), I just wanted to say how to make these cookies gluten-free. I used 2 cups + 2 tablespoons of gluten-free flour, and 3/4 teaspoon of xanthan gum. 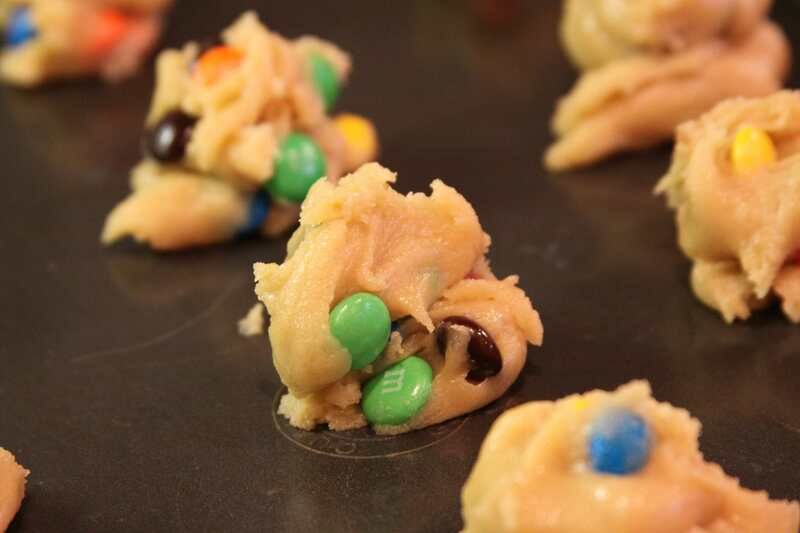 The dough will be a little squishy, for lack of a better adjective, but the cookies will turn out fine. Ok I’m done now. Submitted by the always lovely Marie. 1. Salsa: if you want to make your own, that’s good, but I’m allergic to mangoes so I stuck with a low-calorie store bought version. Allergic also sometimes equals too lazy and didn’t have enough time…. 2. Cream Topping: Plain Low-Fat Yougurt + 1/2 tsp of Fajita seasoning (I used twice that because I love Fajita seasoning). Mix and refrigerate. Also spill some seasoning on the floor and dip your sleeve in yogurt (try both at the same time for BONUS POINTS!!). 3. Fish: as much fish as you need–the recipe calls for tilapia; I used cod, but it took for.ev.er. to cook. Best to actually do what the recipe says, wonder of wonders, and use tilapia. Season it with salt and pepper and lime juice. Bake for about 8-10 minutes. 4. Spicy Black Beans: 1-2 cans of black beans (depending on how many you are serving–I was serving 8 and we had just enough for one each) in a pot with pre-sauteed 1/2 diced onion and 2-4 cloves garlic, 1 tsp cumin and 1 tsp chili powder. Mix it all up and spill lots of black bean juice on your pants. 5. Slice up your cabbage (or romaine, or iceberg, or rice if you are feeling like eating lots of carbs) and lay it over a toasted tortilla. Top this with the rest of your ready made ingredients and PRESTO-YUMO: you now have some deliciously amazing tacos. 6. Eat them very messily. Apparently my dog is borderline obese. I’m sorry, I really am not a good conversation starter. Or ender. Or middler. Actually, let’s just say I’m really not as eloquent as I’d like to be, ok? Ok. Lovely. Today was overcast and cold. Just the kind of day that makes you want to curl up with a novel and a cup of tea. Or bring your spastic dog to the vet. I’ve heard it both ways. My dog Gemma is wonderful, but she seriously acts like I keep her locked in a cage and poke her with pointy objects all day. When I take her out of the house to go on walks (2-3 times a day…), she’s like FREE AT LAST! Every. Single. Time. So just imagine how she was at the vet today. I’ll tell you: she was insane. Her temperature was 103.6 from her almost hyperventilating. Aaannddd she peed on the floor. Is that too much information? Because if it’s not, I might go on to say that she also…loses control of her bladder when she’s around cleaning supplies. No joke. A broom fell on her and it just went downhill from there. The vet started talking about how Labradors tend to be bottomless pits (amen. If I decided to let Gemma eat cheese and peanut butter all day, she would), but they also have knee problems when they get overweight. And hip problems. And elbow problems. And everything problems. So I was like ok…that’s nice? Where are you going with this? Then she pointed to a picture of a dog on the wall and said “See that dog? It has a full chest and a small stomach. Well…your dog is just kind of…full everywhere.” So now I have to cut back on her food and make her exercise more. More walks. Yay. In other news, since I’m really not in the mood to blog everyday, I’m putting my pictures for the 30 day photo challenge on my Flickr. If you care to look at my photos, click on I LOVE SKANDAR KEYNES. It’s true. 2. 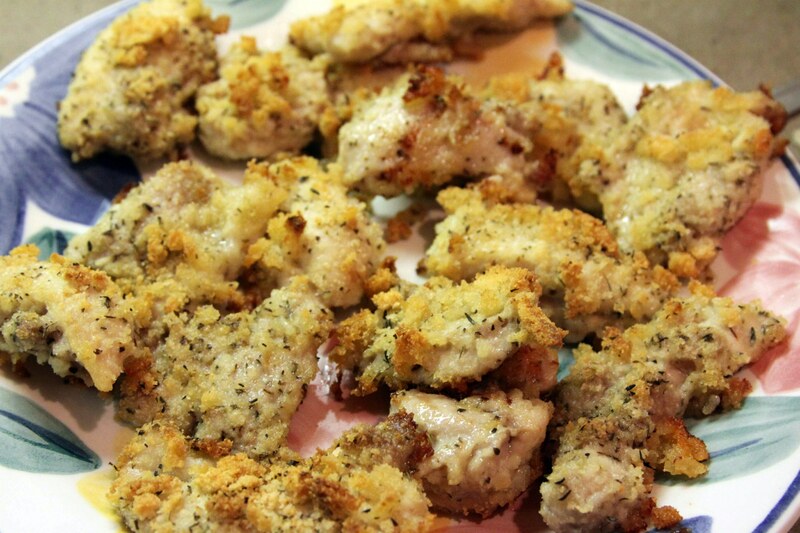 Cut chicken breasts into 1 1/2-inch sized pieces. 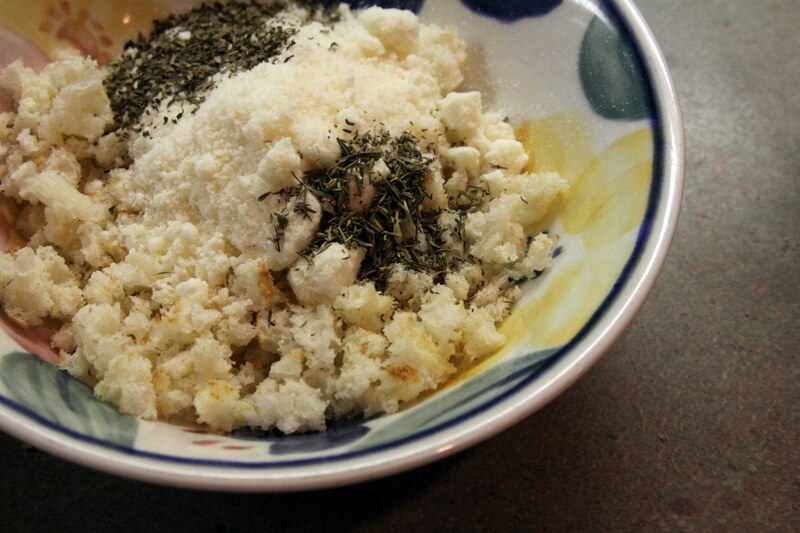 In a medium bowl, mix together the bread crumbs, cheese, thyme and basil. 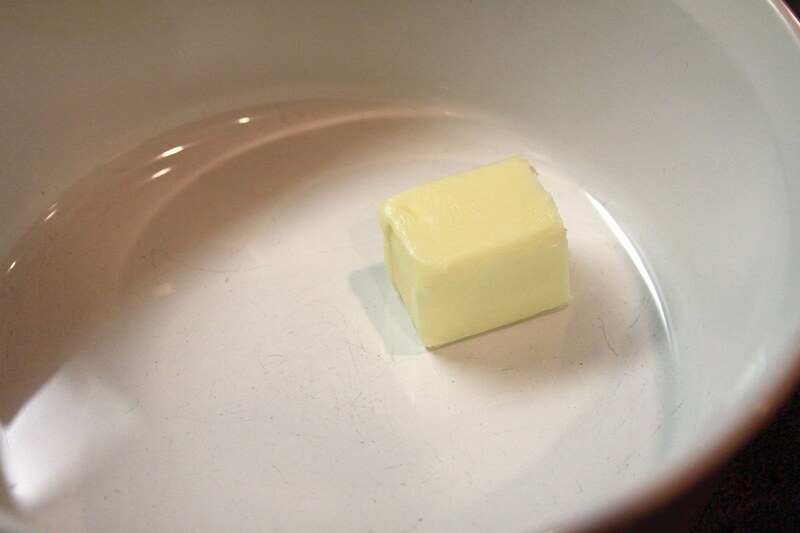 Put melted butter in a bowl. 3. 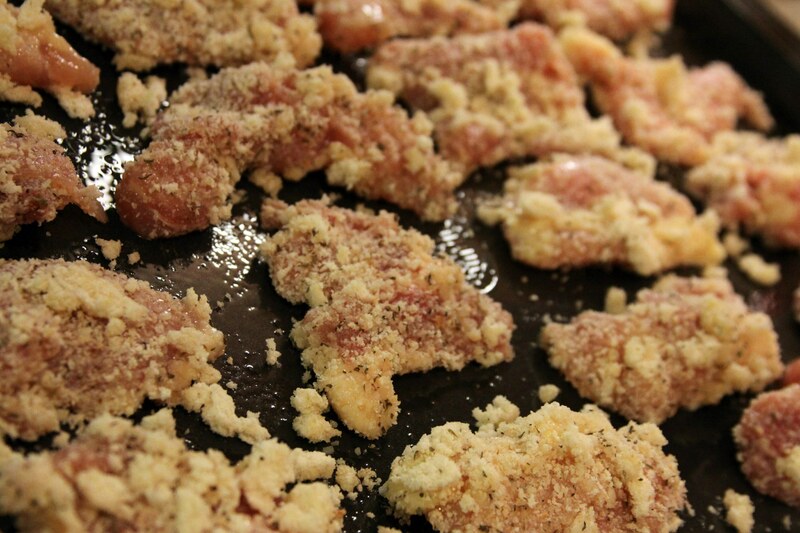 Dip chicken pieces into the melted butter, then coat with the breadcrumb mixture. Place the chicken pieces on a lightly greased cookie sheet in a single layer, and bake in the preheated oven for 20 minutes. For extra crispiness, bake on a cookie rack (that’s what they’re called…right?) so that the bottom doesn’t get all mushy. Or set the broiler on low and broil for 1-2 minutes. 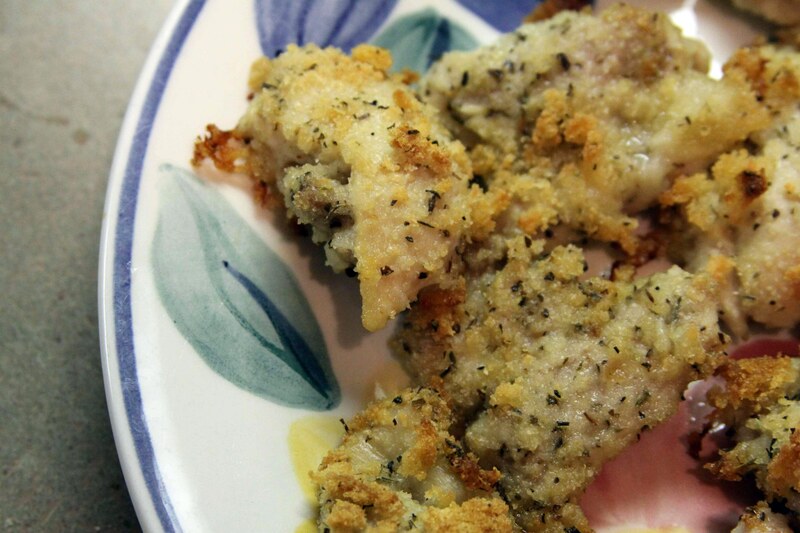 Serve with ketchup, Dijon mustard, or ranch dressing. Or just eat them by themselves, since they’re totally amazing. 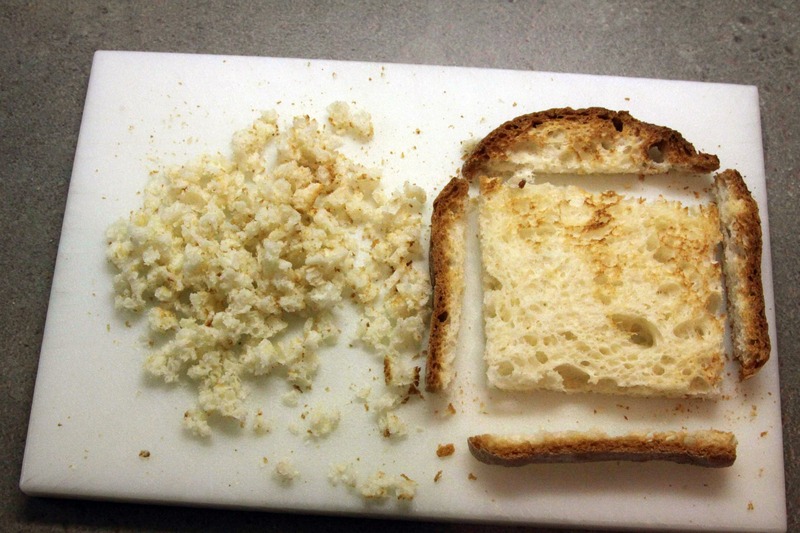 GF note: if you’re using gluten-free bread (I used Udi bread, which tastes almost identical to “normal bread”), the gluten free companies like to gyp people and make the slices smaller, so it takes about 6 slices to make a cup of bread crumbs. In case you were wondering.